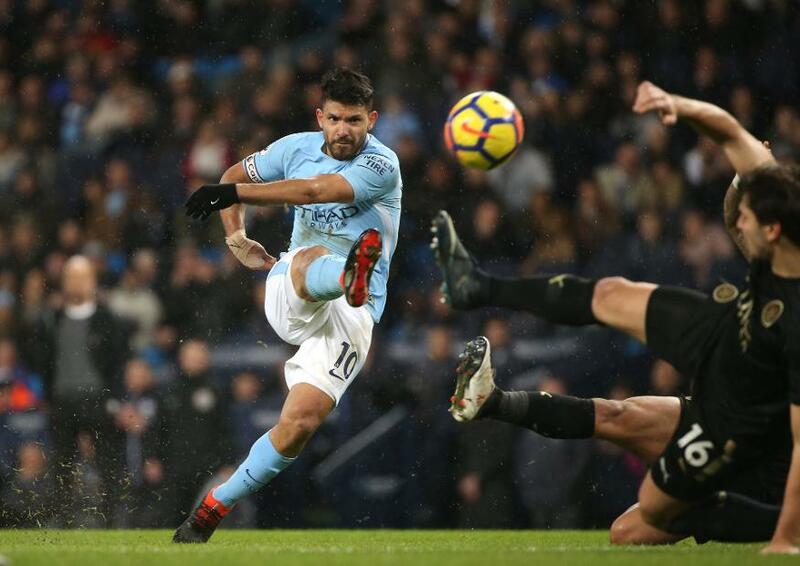 Sergio Aguero fired four second-half goals as Manchester City condemned Leicester City to a 5-1 defeat at the Etihad Stadium. Kevin De Bruyne was the architect of the victory, producing a hat-trick of assists, the first coming after just two minutes and five seconds, which Sterling converted from close range. Leicester levelled on 24 minutes when Jamie Vardy pounced on a loose defensive pass. But City took control after the interval, De Bruyne curling a 48th-minute pass for Aguero to score for the seventh successive home match in all competitions. Five minutes later Aguero raced on to the Belgian’s through-ball to fire through Kasper Schmeichel. Schmeichel then gifted possession to Aguero to complete his eighth Premier League hat-trick. The Argentinian concluded a memorable evening by crashing his 21st PL goal of the campaign in off the bar from outside the area. Man City are 16 points clear at the top. Leicester remain eighth.